A black-and-white photograph of a young, curly-haired woman with a loosely knotted shawl around her shoulders leans against vintage Italian books on a small table near the entrance of Dennis Lange’s new restaurant. “This is the only picture left of her,” Lange says with a devilish grin. He will later admit that the woman who supposedly inspired his restaurant is pure fiction; “Adalina” is just what he happened to pick from a list of Italian names. Lange’s only significant connection to Italy is the time he spent working on architectural digs near Pompeii while in college. Adalina’s location in a condo development does little to evoke the country that inspired it, but the restaurant does share a certain ambition with its surroundings. Formerly the crown jewel of the now-defunct Post Properties empire, the Post Riverside complex opened just south of Vinings in 1998—making it one of the first prestige mixed-use developments inside the Perimeter. There was only one thing wrong with it: The dreary on-site tavern known as the River Room didn’t live up to the posh setting. It closed 10 years ago and was briefly replaced by a wine bar. Lange worked diligently for two years to gut the dark, claustrophobic space facing the main plaza and turn it into an airy vision of modern Italy, the kind of place that could attract the high-caliber chef he was seeking. Lange, known as “Den Chan” to his many fans, is a beloved Atlanta character who’s still remembered for the popular, minuscule Japanese counter named Yakitori Den Chan that he opened in 1992 in the heart of Buckhead. Subsequent projects, including the original Five Seasons Brewing Company and Southbound in downtown Chamblee, cemented his reputation as an exceptional host. 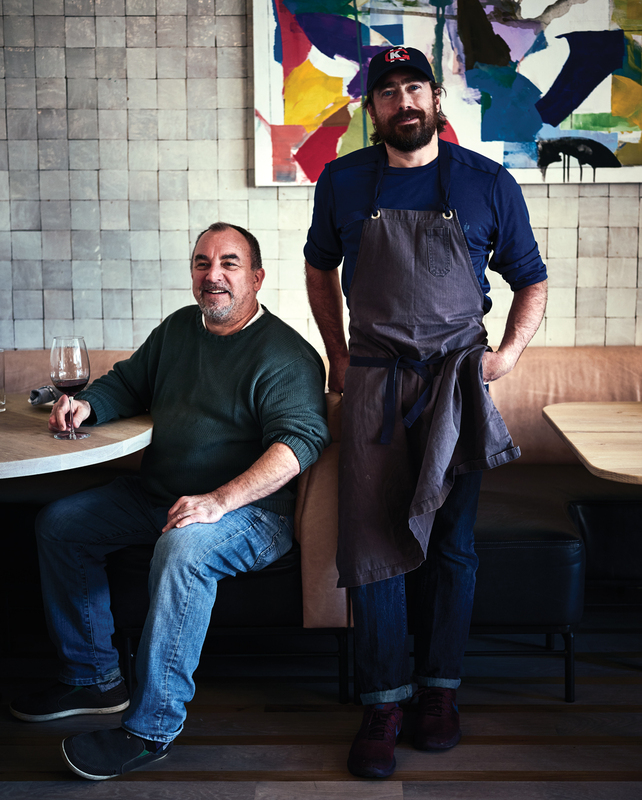 When asked to open a restaurant at Post Riverside, Lange, who would’ve preferred that it be a bar, somewhat reluctantly agreed to step back into the hospitality business after a brief hiatus. But he wasn’t the least bit reluctant about his choice of chef: Joshua Hopkins, a native Atlantan whose resume includes stints at Anne Quatrano’s Bacchanalia and Abattoir, Brian Lewis’s STG, and, most recently, five years as executive chef at Hugh Acheson’s Empire State South. Hopkins had been a regular customer at Yakitori Den Chan. Tempted by the luminous open kitchen Lange was building and the prospect of working with a friend, Hopkins came on board. As a chef, he sometimes has been accused of being too complicated for his own good. At Adalina, he lands—mostly smoothly—on a more simple approach. Hopkins creatively interprets dishes from pizza to fresh pasta to tricked-up entrees such as “chicken press” that’s spatchcocked, cooked sous vide, layered with finely minced forcemeat, cooked again, and served with basil pesto. 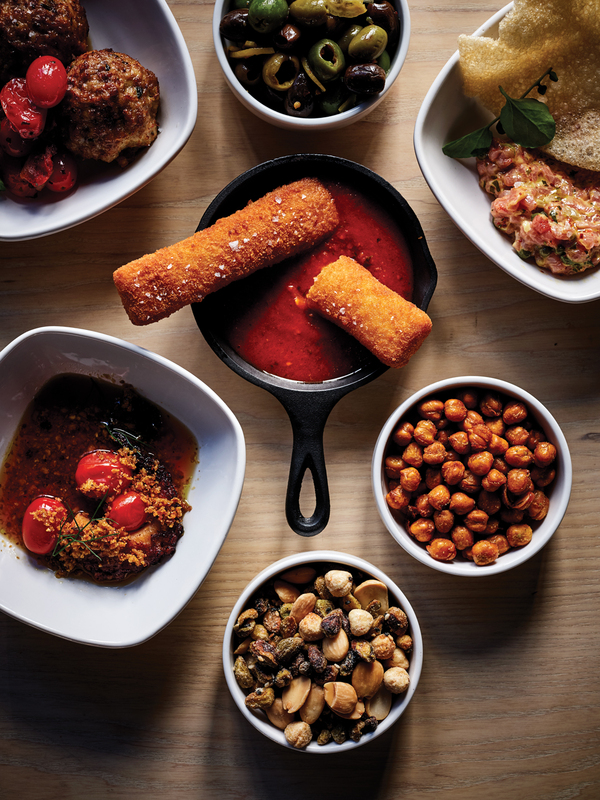 The fun, wine-friendly snacks portion of his menu offers fried chickpeas with pickled chili salt, a spinach and black olive fonduta with crisp housemade breads, mozzarella fries with bright marinara, mussels on toast with tomato conserva, and hot little arancini rice balls stuffed with smoked trout, shrimp, or octopus. 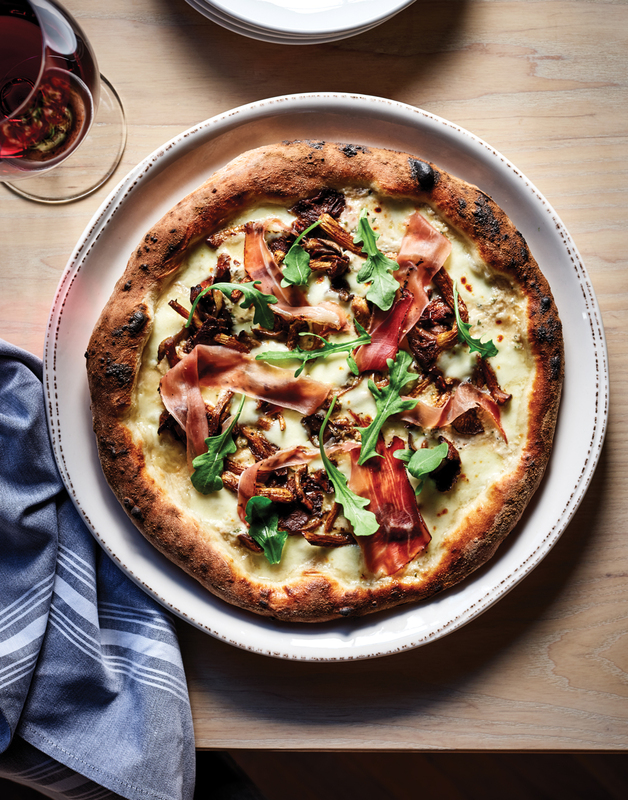 His thin-crust, adequately charred pizzas make good use of the artisanal wood oven and come layered with unusual ingredients such as Loudmouth mushrooms, speck, and fig preserve on a thin smear of ricotta, or butternut squash, beef bacon or pork jowl, and pecorino. 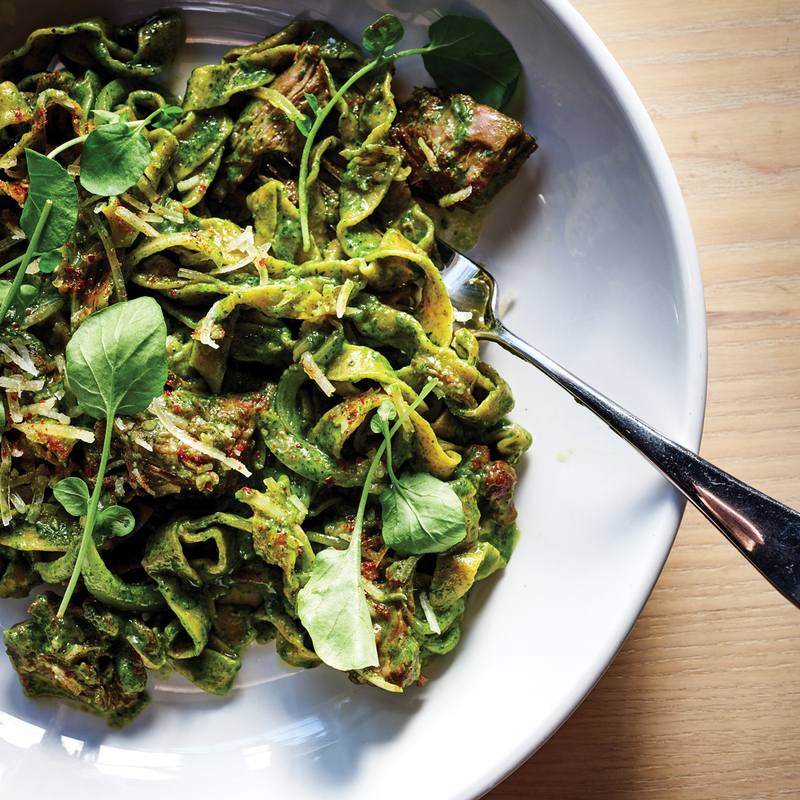 The best of his pasta dishes is the handmade tagliatelle with kale, sunchoke, beef short rib, and almonds. His cavatelli (with crumbled rabbit sausage, little tomatoes, broccoli pesto, and preserved lemon) and his ricotta agnolotti (with sweet garlic and pistachio in mushroom broth) aren’t far behind, but the fresh spaghetti with too-tight duck meatballs is more interesting for its textural contrast than for its taste. Entrees can feel overwhelming, with dishes such as steaks of butterflied and rolled lamb leg with cannellini beans and Castelvetrano olives or North Carolina trout with collards pistou, split okra, and sweet potato gnocchi suffering from too much accessorization. Ambitious desserts, which may send you into caloric overload, include tiramisu macarons, dark chocolate budino, sweet potato monkey bread with lemon cream, and bruleed rice pudding. Tagliatelle with kale, sunchoke, beef short rib, and almonds is the best of Hopkins’s pasta dishes. Lange did end up opening a bar of sorts, albeit one within a restaurant. Adalina’s is generously sized, with wine and beer taps plus fair-priced Italian cocktails such as the Conservatore (spiced rum, Aperol, orange juice, and a dash of orange bitters, topped with soda water). The excellent wine list lingers in the South of Italy, with affordable Falanghina and Nero d’Avola by the glass and more ambitious selections, such as a rarely seen Vigneti Vulture Aglianico, southern Italy’s prized grape, whose balance of flinty and lush notes showcases its volcanic terroir. Local firm Flags of Origin managed the jaw-dropping transformation of an unpleasantly dark tavern into a sweeping open space with a show kitchen and a hospitable yet modern bar. The lights are bright, as is usual in Italy, the tables comfortably far apart, and the acoustic environment pleasant. The service team, led by charming, goofy Marty Stein, who for 25 years worked at Bones, includes a good balance of seasoned professionals and greenhorns, all showing great concern for the customer. Energetic and experienced restaurateur “Den Chan” Lange has created a welcoming and stylish restaurant in a sprawling condo complex, and chef Hopkins’s tendency to show off (which also was evident at Empire State South) mostly works. The best way to experience Adalina—and it’s worth experiencing—is to stick to Hopkins’s snacks, pizzas, and pasta, and to put the unusual wine list to good use.